Over time, excessive use of your garage doors can cause wear and tear. This can be the outcome of rust, abrasion, blunt force, power surges, adverse temperatures, or just general wear from use etc. Regardless of what got your door in the state it's in now, our professionally trained team is on hand to assist you. Continue reading to learn more about our repair services. The opener is a key component in the operation of your automatic door - if there's a problem here, it can lead to larger problems. It provides the power through a motor for raising the door and lowering it. A belt (or chain) then wraps around a rod which protrudes from the motor. This belt then connects to the arm on the door. When the motor turns one way, the door opens, when it turns the other way, the door closes. If your belt is worn or giving you a hint of trouble, you should have it looked at. Give us a call to discuss having it repaired or replaced. Metallic parts of a garage door don't respond well to adverse temperature changes. Very low winter temperatures can cause the metal parts to shrink, causing the rollers to become stiff. Cold weather can also make some of your metal parts brittle and more likely to break. High temperatures can also cause problems over time. Contact us to discuss hinge repairs or other related components. Door Won't Open and Close Properly? If your garage door opens halfway then returns to its closed position, our technicians can help you to correct the problem. Opening and closing issues usually indicate a need to repair or replace a faulty component. Whatever the cause, we are well equipped to handle it. For more information regarding how our technicians can help you with garage door repairs, contact our team at Garage Door Repair Glendale. We provide a wide assortment of garage door services so you can be sure we have you covered no matter what the problem may be. Because we are a locally based company, our team of expert technicians is always just one phone call away. 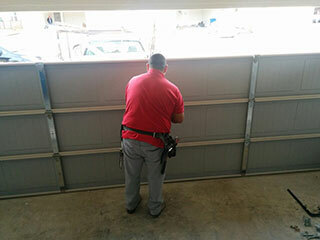 Thank you for choosing Garage Door Repair Glendale! One of our experts will be in touch soon. Feel free to browse our website for FAQ, tips and more useful information in the meantime!